Catholicose H.B.Baselious Thomas 1st inaugurated the meeting. Their Graces Dr.Mor Gregroious Joseph, Dr.Mor Theophilose Kuriakose, Dr.Mor Coorilose Geevarghese, Mor Ousabious Kuriakose, Mor Aphrem Mathews, very Rev. Moolayil Kuriakose Chorepiscopa & other priests represented the Syriac Orthodox Church. Catholic Church was represented by H.E. 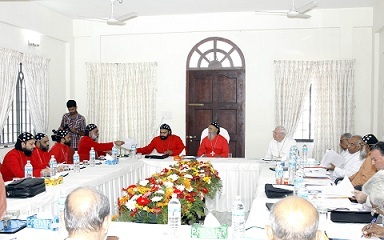 Arch Bishop Mor Joseph Pawathil (Emiritus), H.E.Arch Bishop Thomas Mar Coorilose and other officials.